2439.09 Kb The GY-HMQ10 is a newly-developed next-generation handheld 4K camcorder, featuring extremely high definition 4K2K progressive video recording on widely available SDHC Class 6 or Class 10 memory cards, presently available in capacities up to 32GB - or SDXC memory cards for capacities of 64GB-128GB - via four memory card slots. At the heart of the camcorder is the world's first large-scale integration (LSI) chip, also developed by JVC, which enables high-speed signal processing, encoding and recording of the 4K2K images for both video and stills. The GY-HMQ10 uses 144 Mbps MPEG-4 AVC/H.264 for recording 4K2K video with up to12 mio. pixels (3840x2160p), with smooth processing of progressive format and solid panning. At only 1.4 kg the GY-HM150 is one of the lightest Camcorders on the market. 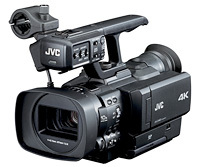 It features JVC’s 3 chip 1/4 “ progessive CCD , a 10x zoom Fujinon HD lens with new Rotary Optical Image Stabilizer technology and a 2.7” LCD Monitor. For Journalists, VJs and for everybody who is looking for total mobility this camcorder is the perfect tool where a fast editing workflow is required. The camcorder records native QuickTime files, so you can start editing immediately in Final Cut Pro and other major non-linear editing systems – all without breaking a sweat. And because it records high definition video and uncompressed audio directly to inexpensive, readily available SDHC and SDXC media cards, you can keep on shooting for hours without risking breaking the bank. It is also our first camcorder to offer both SD and HD shooting options. 2354.72 Kb NEW! The next-generation handheld ProHD camera that delivers exceptional imagery and features for news, sports, and independent production. Light, versatile and extremely easy to use, this camera is designed for fast paced ENG - offering superb low light performance, a long (23x) wide angle zoom lens, and expanded file interoperability from acquisition to air. 2639.72 Kb NEW! Small and light enough to be used anywhere, this advanced camera surpasses the performance of many traditional ENG style units and offers capabilities never before available on any model. Dual codecs make it possible to record for 2 screens simultaneously: full HD on one memory card and a smaller web-friendly file on another card. Transfer the footage back to the station with the GY-HM650's built-in FTP and WiFi connectivity. The GY-HM650's long (23x) wide angle lens is perfect for fast paced ENG. The camera offers superb low light performance with F11 sensitivity at @2000 lux. 168.00 Kb HD Camcorder Memory Card Request your price! 1990.49 Kb HD Camcorder Memory Card Head Request your price! 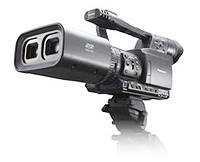 1344.93 Kb (A) HD Camcorder Head DV out Request your price! 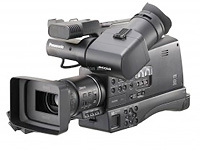 1344.93 Kb (A) HD Camcorder DV out, 14x lens Request your price! AG-HPX600 NEW! AG-HPX600, a new P2 HD camera recorder with 10-bit, 4:2:2 AVC-Intra recording and the lowest weight of a shoulder-mount unit. Weighing less than 3.2 kg and using low power, the HPX600 combines a newly-developed 2/3 type MOS sensor to produce high-quality HD and SD images. The HPX600 will achieve the high sensitivity of F12 (at 59.94 Hz) and a signal-to-noise ratio of 59dB. It supports AVC-Intra100/50, DVCPRO HD, DVCPRO50, DVCPRO, and DV as standard. It is 50 Hz and 59.94 Hz switchable for worldwide use. 2227.16 Kb P2 HD 1/3 Camcorder Request your price! 4655.32 Kb P2 HD 1/3 Camcorder Request your price! 4119.29 Kb P2 HD 1/3 Camcorder (incl. colour viewfinder) Request your price! 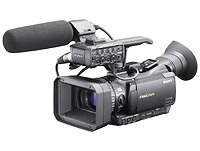 171.12 Kb P2 HD 2/3 Camcorder 16:9 / 4:3 (supplied w/ VF) Request your price! 1067.53 Kb HD/SD P2 Camcorder 2/3" IT 16:9 / 4:3 Request your price! 4680.07 Kb HD P2 Camcorder 2/3" IT 16:9 / 4:3 Request your price! 2216.23 Kb HD P2 1080i Camcorder 2/3" IT 16:9 / 4:4 Request your price! AJ-P2E016XG 16GB P2 Card economic card Request your price! AJ-P2E032XG 32GB P2 Card economic card Request your price! AJ-P2E064XG 64GB P2 Card economic card Request your price! 4580.93 Kb Shoulder Camcorder AVCHD Request your price! 1859.16 Kb 1/3" Palmheld Camcorder AVCHD Request your price! 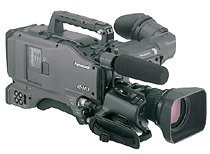 7875.75 Kb 1/4" Palmheld Camcorder AVCHD Request your price! 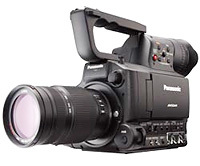 1576.94 Kb 1/3" Palmheld Camcorder AVCHD Request your price! 2827.60 Kb 4/3" Type Sensor Camcorder Request your price! 2665.44 Kb POVCAM camera - excludes cable Request your price! 2941.71 Kb The AG-3DA1 is the world's first professional, fully-integrated Full HD 3D camcorder that records to SD card media. The AG-3DA1 will democratize 3D production by giving professional videographers a more affordable, flexible, reliable and easier-to-use tool for capturing immersive content as well as providing a training tool for educators. At less than 6.6 pounds, the AG-3DA1 is equipped with dual lenses and two full 1920 x 1080 2.07 megapixel 3-MOS imagers to record 1080/60i, 50i, 30p, 25p and 24p (native) and 720/60p and 50p in AVCHD. 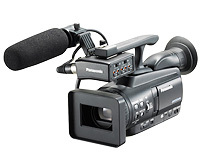 It can record for up to 180 minutes on dual 32GB SD cards in Panasonic's professional AVCHD PH mode, and offers professional interfaces including dual HD-SDI out, HDMI (version 1.4), two XLR connectors, built-in stereo microphone and twin-lens camera remotes. 795.21 Kb CINECAM26KEF Blackmagic Cinema Camera EF - One of the world’s finest digital film cameras with a beautiful design that features a machined aluminum chassis, interchangeable optics, high resolution 2.5K sensor, 13 stops of dynamic range and 12-bit RAW uncompressed and compressed ProRes and DNxHD file formats! Includes sun shield, power supply, carry strap, UltraScope waveform monitoring software and a full version of DaVinci Resolve Software for Mac OS X and Windows. (Lenses are not included and must be purchased separately) Request your price! 795.21 Kb MFT CINECAM26KMFT Blackmagic Cinema Camera MFT Request your price! 795.21 Kb PL CINECAM26KPL Blackmagic Cinema Camera PL Request your price! Cinema Camera Handles CINECAMHANDLE Optional handles for shooting in locations where you need to move around quickly with your camera. Handles let you steady your shot and keep up with the action! Request your price! Micro Cinema Camera CINECAMMICHDMFT Blackmagic Micro Cinema Camera Request your price! Micro Studio Camera 4K CINSTUDMFT / UHD / MR Blackmagic Micro Studio Camera 4K Request your price! PL Mount Shim Kit CINECAMUSPLSHIM Blackmagic PL Mount Shim Kit Request your price! Pocket Cinema Camera CINECAMPOCHDMFT Blackmagic Pocket Cinema Camera - a true Super 16 digital film camera that's small enough to take anywhere! Introducing the pocket sized Super 16 digital film camera that's small enough to keep with you at all times, so you'll never miss a shot! Get true digital film images with feature film style 13 stops of dynamic range, Super 16 sensor size, high quality lossless CinemaDNG RAW and Apple ProRes™ recording and the flexibility of an active Micro Four Thirds lens mount, all packed into an incredibly tiny size! The Blackmagic Pocket Cinema Camera records 1080HD resolution ProRes 422 (HQ) files direct to fast SD cards, so you can immediately edit or color correct your media on your laptop. Blackmagic Pocket Cinema Camera is everything you need to bring cinematic film look shooting to the most difficult and remote locations, perfect for documentaries, independent films, photo journalism, music festivals, ENG, protest marches and even war zones. 217.75 Kb CINECAMPROD4KEF Blackmagic Production Camera 4K - world’s most portable 4K digital film camera! Shoot Ultra HD TV or 4K feature films with the new Blackmagic Production Camera 4K. You get a large Super 35 size sensor with professional global shutter combined with precision EF mount optics, high quality visually lossless compressed CinemaDNG RAW and Apple ProRes 422 (HQ)™ file recording for a complete self contained solution. The built in touchscreen lets you monitor, change settings and enter metadata directly on the camera! 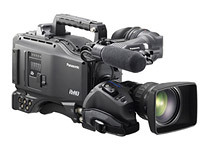 217.75 Kb PL CINECAMPROD4KPL Blackmagic Production Camera 4K PL Request your price! 1038.59 Kb CINSTUDMFT / HD The Blackmagic Studio camera features a compact and durable magnesium alloy body that is packed with innovative technology, making it the most rugged, portable and advanced studio camera in the world. You get a huge 10” viewfinder with sunshade for optimal viewing and control, a flexible MFT mount that gives you more lens options than any other studio camera, multiple mounting points and professional broadcast connections. From the newsroom to live sporting and theatrical events, there’s no faster way to capture the beauty and realism of Ultra HD 4K than to record a live switched program with Blackmagic Studio Cameras! The Blackmagic Studio Camera features an active Micro Four Thirds lens mount that is compatible with an incredibly wide range of lenses and adapters. The Blackmagic Studio Camera is the world’s first to include a built in fiber optic connection, allowing you to use a single thin tether cable to connect cameras to your live production switchers. The Blackmagic Studio Camera features built in talkback so the camera operator and crew can communicate at all times during production. The Blackmagic Studio camera supports the tally SDI standard used on the ATEM range of live production switchers. Tally lights illuminate automatically when your camera is live, and will stay illuminated during multiple camera transitions. With a light on the front for talent, and a light above the viewfinder for the operator, cast and crew can easily see which cameras are on air. Request your price! 1038.59 Kb 4K CINSTUDMFT / UHD The Blackmagic Studio camera features a compact and durable magnesium alloy body that is packed with innovative technology, making it the most rugged, portable and advanced studio camera in the world. You get a huge 10” viewfinder with sunshade for optimal viewing and control, a flexible MFT mount that gives you more lens options than any other studio camera, multiple mounting points and professional broadcast connections. EF CINECAMURSA4K / EF Blackmagic URSA is designed to be used on high end feature films, commercials, episodic television production, documentaries, electronic news gathering, music videos and more. URSA is a true professional digital film camera with a 4K sensor, global shutter and an incredible 12 stops of dynamic range. The wide dynamic range blows away regular video cameras or even high end broadcast cameras, so you get dramatically better images that look like true digital film. The wide dynamic range preserves detail in dark shadows as well as bright highlights so you have a wider range of brightness levels to work with when color grading in post production. The extra large Super 35 size allows for creative shallow depth of field shooting and the high resolution Ultra HD 12 bit lossless Cinema DNG RAW means you get incredible quality! Request your price! PL CINECAMURSA4K / PL Blackmagic URSA is designed to be used on high end feature films, commercials, episodic television production, documentaries, electronic news gathering, music videos and more. 4.6K EF CINECAMURSA46K / EF Blackmagic URSA is designed to be used on high end feature films, commercials, episodic television production, documentaries, electronic news gathering, music videos and more. 4.6K PL CINECAMURSA46K / PL Blackmagic URSA is designed to be used on high end feature films, commercials, episodic television production, documentaries, electronic news gathering, music videos and more. Blackmagic URSA Mini 4.6K EF CINECAMURSAM46K/EF Blackmagic URSA Mini 4.6K EF Request your price! Blackmagic URSA Mini 4.6K PL CINECAMURSAM46K/PL Blackmagic URSA Mini 4.6K PL Request your price! Blackmagic URSA Mini 4K EF CINECAMURSAM40K/EF Blackmagic URSA Mini 4K EF Request your price! Blackmagic URSA Mini 4K PL CINECAMURSAM40K/PL Blackmagic URSA Mini 4K PL Request your price! Blackmagic URSA Viewfinder CINECAMURSANEVFP Blackmagic URSA Viewfinder Request your price! Blackmagic URSA Mini Shoulder Kit CINECAMURSASHMKM Blackmagic URSA Mini Shoulder Kit Request your price! Blackmagic URSA Shoulder Kit CINECAMURSASHMK Blackmagic URSA Shoulder Kit Request your price! For journalists, documentary makers and anyone else who needs capture superb content whatever the conditions, the dust and rain-proof HXR-NX70E is the perfect compact camcorder. In low light conditions, its Exmor R™ CMOS sensor delivers roughly double the sensitivity of conventional CMOS sensors, while an ultra-wide angle 26.3mm Sony G Lens™ lets you capture more of the action in close shooting situations. You can also ‘geo-tag’ your precise location with built-in GPS, while 96 Gigabytes of embedded Flash Memory provides up to 40 hours of storage capacity - ideal when operating in remote locations.